Going for the gold. 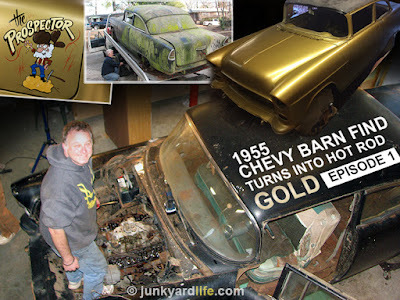 Junkyard Life’s Ron Kidd finds his dream car, a 1955 Chevy in a barn. During his budget restoration, Kidd decided to pay homage to the gold 1955 Chevy that GM built to commemorate their 50 millionth vehicle. 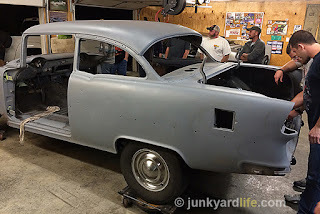 With his team of friends and a vision to recapture bygone glory days of the 1960s and 1970s, he goes “old school” on the black, 4-speed, shoebox Chevy. Watch as he enlists artist Michael Swann to customize the hot rod with retro graphics. The timelapse portion of the video shows Swann at work painting “The Prospector,” lettering, and pinstriping the ’55 over a 2 hour period. 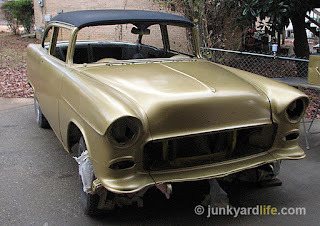 Kidd’s gold ’55 will be sure to make a splash when it hits the scene. Stay tuned for more! Do you have a classic or muscle car barn find? Send us details and we’re on the way! 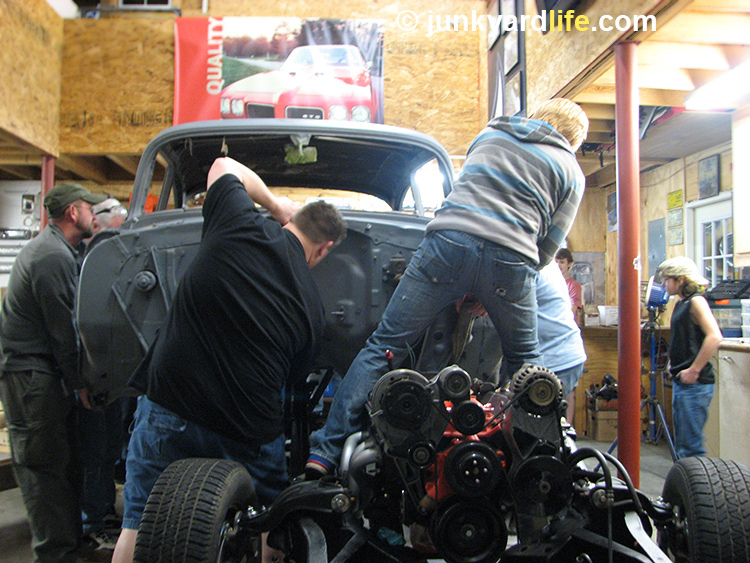 Send emails to Jody Potter at junkyardbull@gmail.com or Ron Kidd at Kidd403@bellsouth.net. 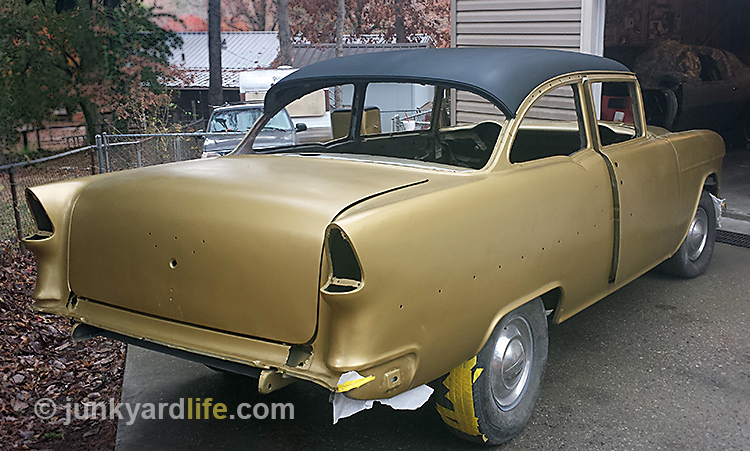 Prospects are high for our 1955 Chevy Bel Air hot rod. 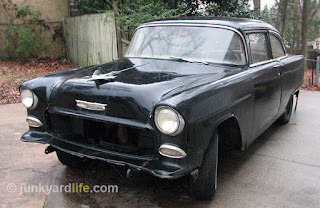 “Whatever became of the black ’55 Chevy that Junkyard Life rescued from a pole barn seven years ago?” That question usually gets directed to me (Ron). Life, not the cool Junkyard Life, just gets in the way sometimes. Hold on, before I show you where we are now - let me give you a brief history. You may not even remember this car. When I brought it home, I was only kind of sure it was black. With our hot rod hearts fluttering, we began the adventure. But first, what is this? The ’55 Chevy landed with all the barn find goodies in place. Rust, rodents and some minor floorpan rot. A little Junkyard Life number decoding revealed this as a 1955 (we knew that!) 2-door Bel Air Post Sedan. Factory born in solid white (India Ivory) paint and powered by a six cylinder engine backed by a manual 3-speed transmission. Purchased new in Birmingham, Alabama, the car changed hands by the mid-1960’s. Sometime around 1969, it also has a change of personality and received a flat black paint job, a hot-headed 327, and a 4-speed. 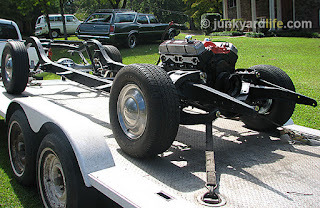 It raced around local haunts and drag strips until sidelined in the mid-1970s due to a balancer bolt on the crankshaft that gave the owner fits. 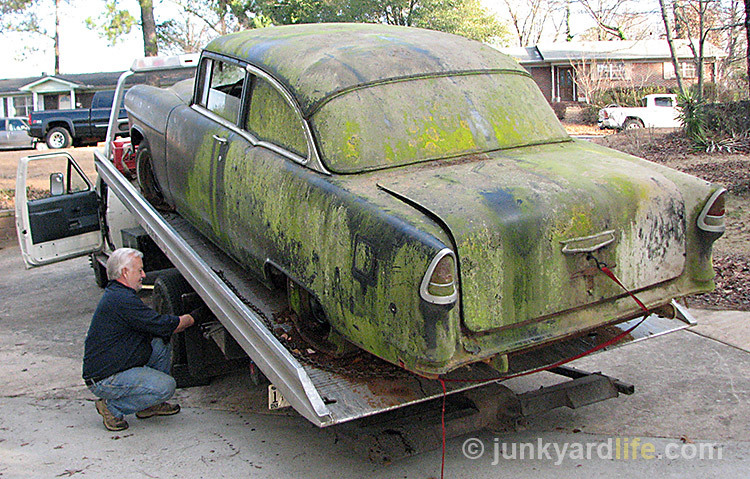 For three decades it was parked under a homebuilt shed until I declared, “Your coming with me!” and pulled it up on a flatbed to embark on a new life. I bought it! After a date with the pressure washer, the ’55 Chevy is shiny and clean. Under the green paint was indeed a black sedan. How cool! The body was in considerably good condition with just a few things to worry about. I wish I would have left it like this. Oh no, not me. I must tear it down a little. That couldn’t go wrong, could it? Ask me again in 2018. Turquoise and white interior is original 1955 issue but not original to this car according to trim tag. 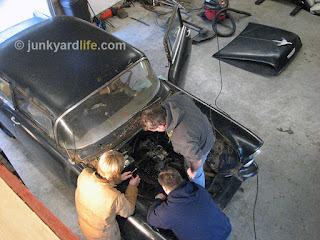 Aerial view of Ron Kidd and some of the Junkyard Life crew. Dare we? It was locked up tighter than a tennis racket, so, yes. Lets do. 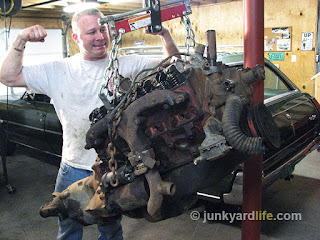 Ron Kidd outmuscles the 327 Vette engine. Done! Dr. Yank’em wins again! Somewhere around this point was where I had the bright idea to redo the suspension and brakes. I do want the car to roll again and stop safely. 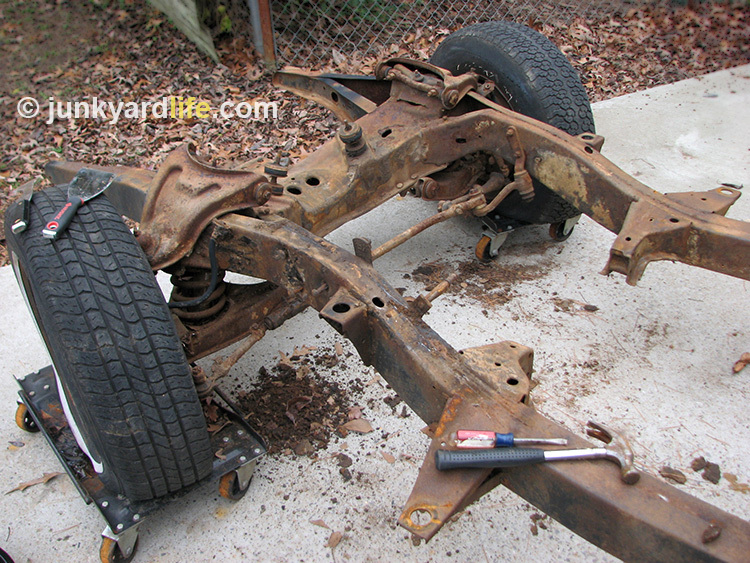 Well, the only way to do that is to remove the body and work it from the frame up! Well, that was our thought process at the time. 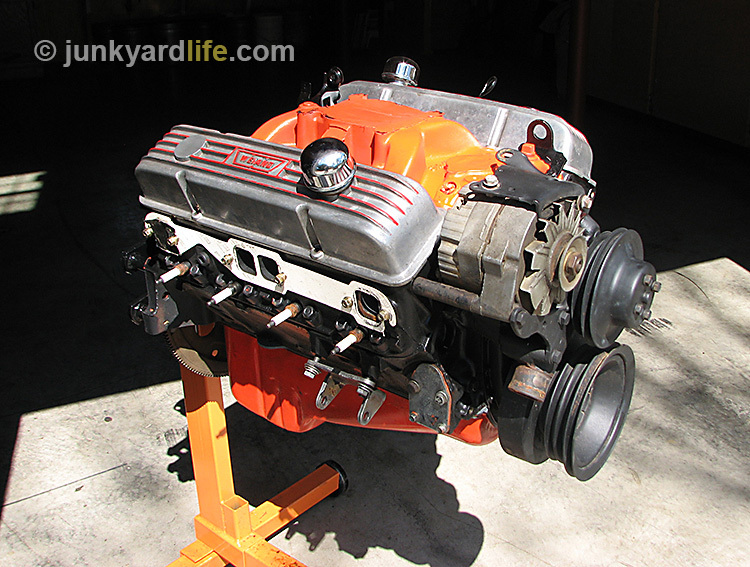 A hot 283-V8 engine awaits delivery into the engine bay. I could not find a useable 327-cu. inch engine to replace the one found in the car. I wanted (actually purchased) a 454 big block, only to realize my other fellow hot rodders with ’55 Chevys and big blocks must have a shoehorn and a degree in Chinese jigsaw. 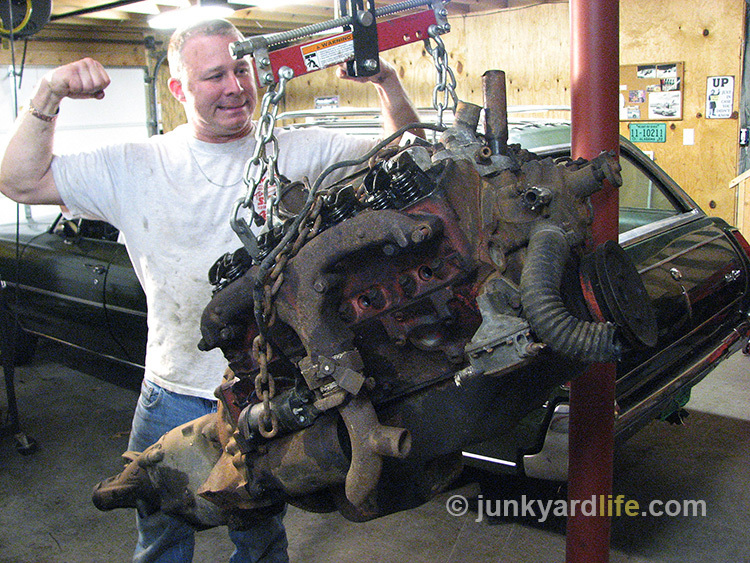 I knew it would fit, but please... To save myself from removing the brake booster just to change a valve cover gasket, I hunted and found a 283-V8 from a 1966 Impala with Powerpack heads and a decent cam. A high-revving 283 seemed appropriate for our hot rod. Before the body came off, I sent it half-naked (Editor’s Note: the CAR was half-naked, not Ron himself. See Fun Facts) to have floor pans installed. Why before? Well, for those of you inclined to do a frame-off on a car, it is wise to do the pans before the body comes off. Thus, helping insure the darn thing will fit back on. So, off it went! With the front end removed, the ’55’s original white paint is visible on firewall. 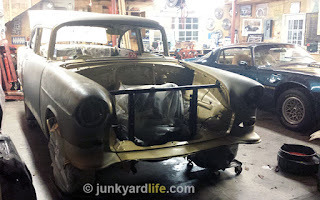 355 geared rearend ready to roll under the 1955 Chevy frame. My sincere rear that will always follow me (unless something goes horribly wrong) is kind of a funny story. I was going to order the brakes (disc all around) and they asked me which carrier I had. Hmmm... I hadn’t shopped for that yet and had a few in mind. That is not specific enough to tell an aftermarket brake salesman. They had to know now! So I answered with the only rear I had for it... the original 1955 unit. Eaton provided a 3:55 posi and new internals. This came after a failed lesson on “planetary gears.” What are those? Ask your granddaddy. We certainly didn’t know. 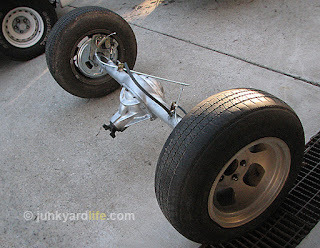 Now, I may be the only guy in town with a ’55 rear carrier with four-wheel disc brakes! Ron Kidd, left, and Michael Clay get ready to spring into action. 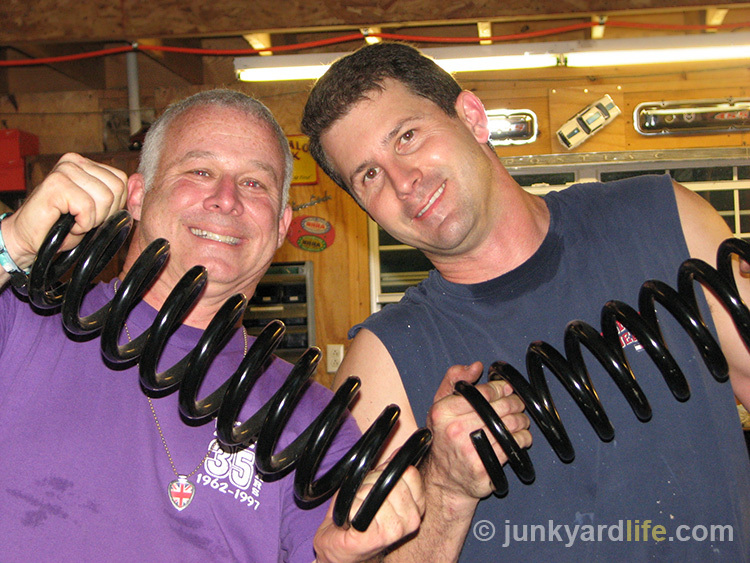 Who needs a spring compressor when you have Ron and Mikey? ’55 Chevy frame is a dirty, rusty mess. Time to work and clean-up the frame for paint and new components. Off comes the body and now time, attention, and a boat load of money go into the frame. New suspension, new brakes, new bushings, a relocated rear shock brace mounted in the frame rails, new leaf springs, new coil springs, modern motor mount install, power steering box install and much more. Including sandblasting and new coating! That just doesn’t stop being funny. Here it is shown with 15-inch steelies wearing 1949 Bel Air hub caps. They look plain from here, but are actually quite unique. 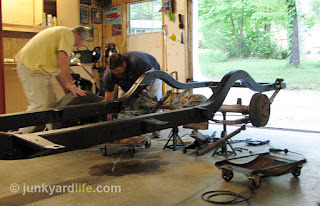 On the trailer with the rear end mounted, the brakes and suspension in place and the 700R4 transmission. I have yet to pick a converter. I am actually looking forward to what they come up with for a high-revving 283-V8 with 3:55 gears. 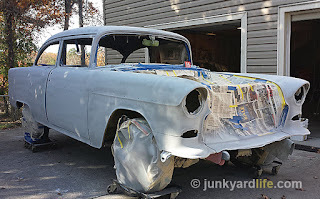 1955 Chevy body stripped of paint as it sits on homebuilt wood stand ready for a coat of primer. Notice the remnants of turquoise paint? 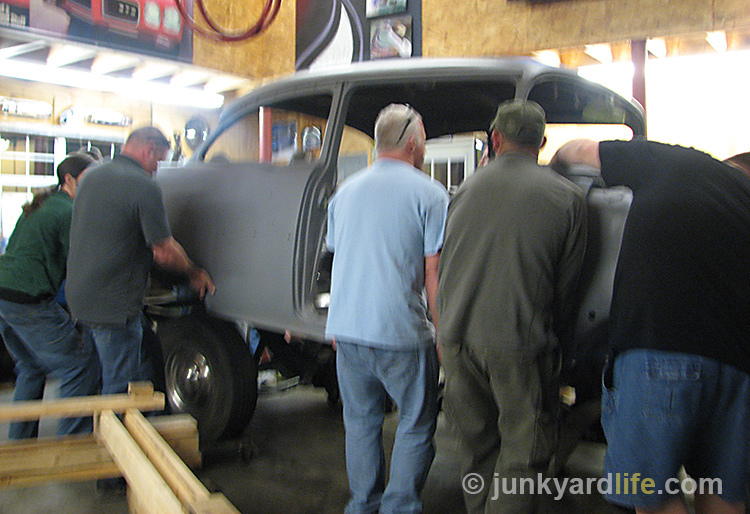 Meanwhile, back at the ranch the body work begins. But hark! The Junkyard Life Automotive Archeology Department uncovers evidence of yet another life! It seems this Bel Air spent some time cleverly disguised in a turquoise and white two-tone. When was this? 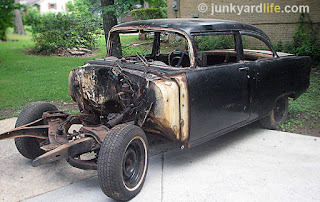 We knew the ’55 was purchased new by an older lady in solid white paint and by the late 1960’s, it wore a flat black during its street racer/street machine days. So, which owner painted it this very popular color combination? Whoever did, also went to the trouble of installing a matching interior. We knew the seat was for a 1955 Chevrolet, but according to the trim codes, not THIS 1955 Chevrolet. What else is this car not telling us? A team of Junkyard Life friends and family lift the ’55 body back onto the refinished frame. After endless chemical stripping, sanding, primering, patching, augmentation, sneezing, swearing, asking myself, “why?,” body filler, more sanding, the time finally came to put the body back on. So, I called everyone I knew and we heaved that Bel Air back onto the frame where it should have been the entire time. My entourage included Ford guys, computer car guys, old school hot rod guys, drag racers, and most other genres of the hobby. Thank you all so much! 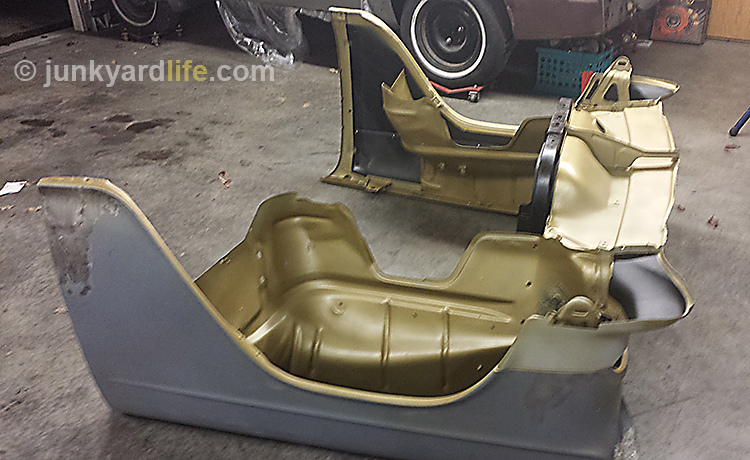 Primered body on and new floor pans shine. Welcome home! Now the next stumbling block was me. 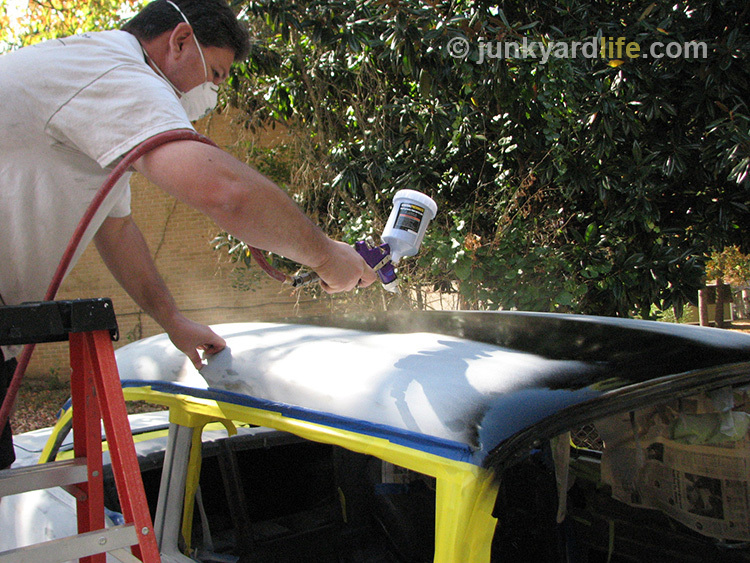 I always felt the car was not ready for paint. I was never completely happy with my amateur body work. That was the confusing part, because I never wanted to it be perfect. I just wanted it to be ready. And was it ready for paint? 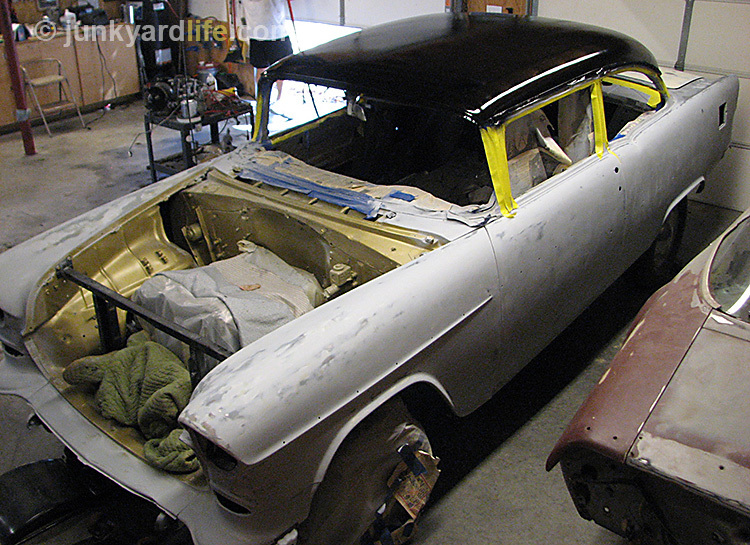 This was not a natural progression in the resurrection of this Bel Air. If not for longtime gear head friends, Gavin Parks and Jason Trammell, this wouldn’t have happened. We marked-off time, bought spray guns and went to town. By “town” I mean the driveway — and by the painter vested in me — we painted it! First, the firewall and jams are painted. 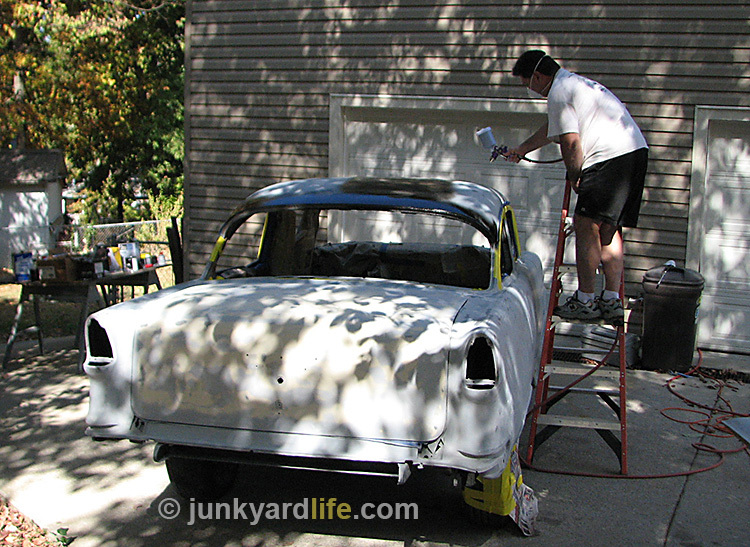 Under the fenders, under the deck lid, behind the ears and everywhere. Underside of front clip painted while off the car. Keith Lively and I bolted the front clip back on and the ’55 Chevy and it looked like a car again! 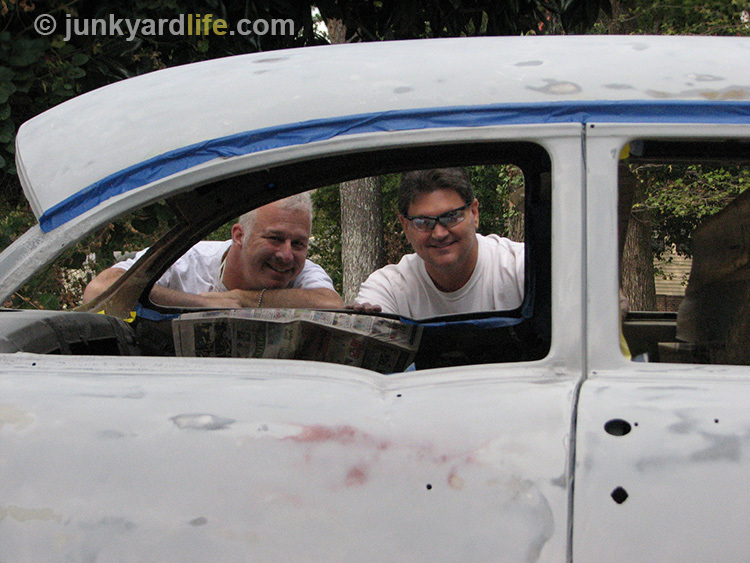 The 1955 Chevy was rolled into Junkyard Life’s outdoor paint booth. Kidd and Trammell are determined to lay some paint on the ’55. 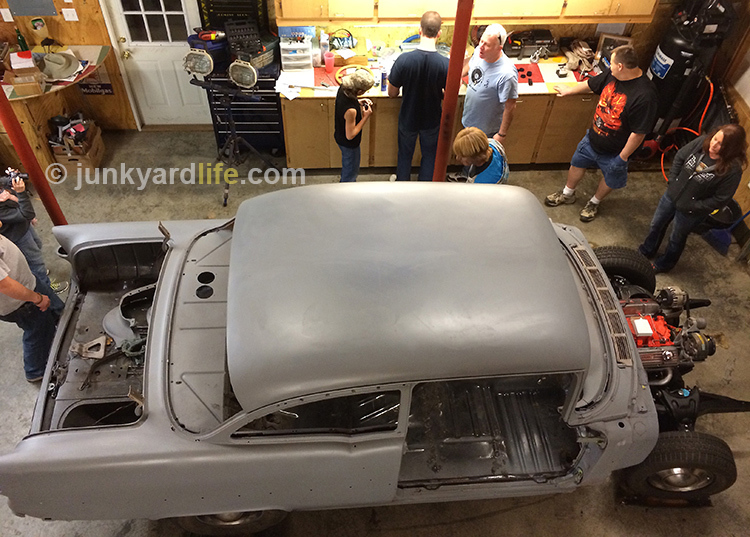 We decided to do a Hot Rod two-tone with a flat black roof. 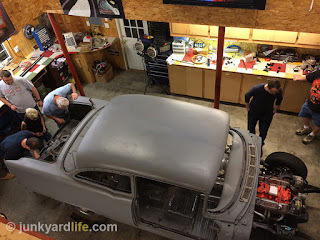 Jason Trammell sprays the roof of the ’55 Chevy. My “One Lane Black Top. Now to go for the gold (pun intended! High-five to self). 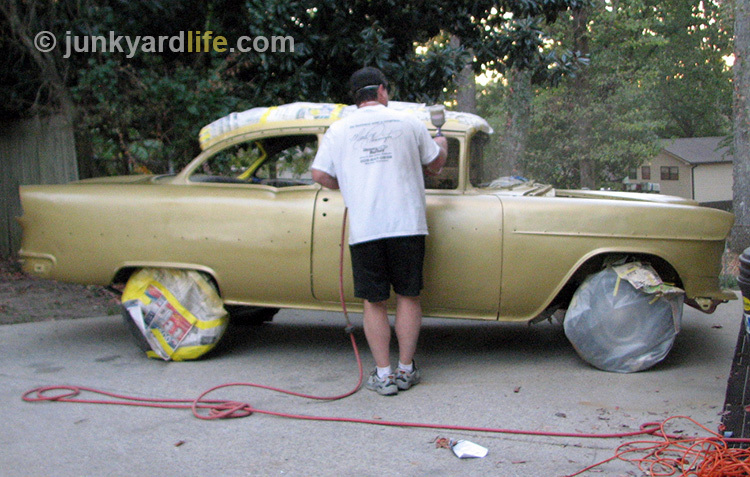 Painting the hot rod 1955 Chevy Junkyard Life style. 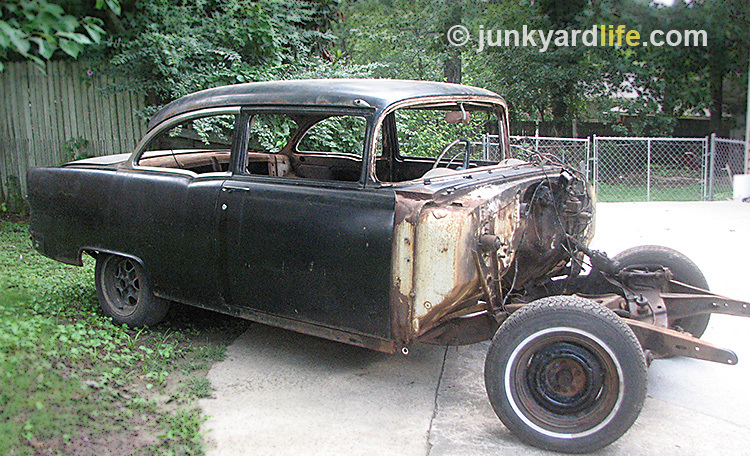 Junkyard Life is all about budget-friendly hot rods. Layer after layer was applied. 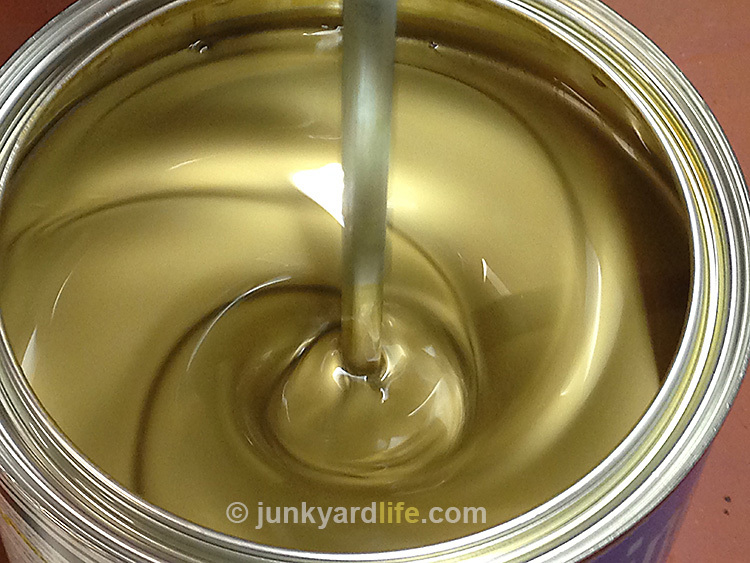 Then the matte finish clear coat again. Layer after layer until finally Junkyard Life had a two-tone black and gold ’55 Bel Air hot rod, circa 1965. Just as it would have looked as a hand-me-down street machine, like you would find in a high school parking lot! 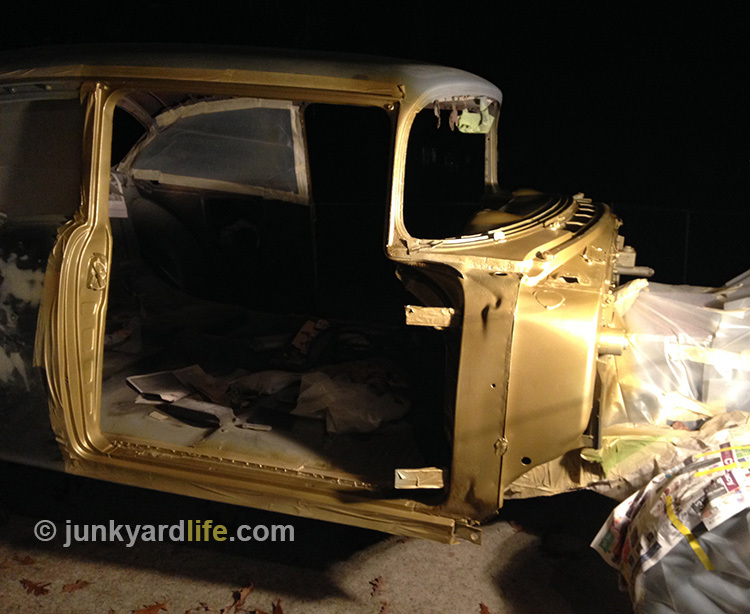 Tiger Gold paint dried and tape removed. 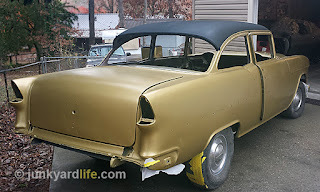 The 1955 Chevy in newly painted Tiger Gold with a black roof. This is the point where I lost focus somewhat. I got obsessed with 1960’s gassers. Jody and I could not come up with a “gold” theme that has not been done several times over. 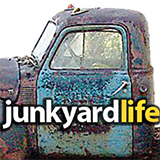 It needed something that would have a cool Junkyard Life representation. Then came the idea for “The Prospector.” We finally came up with a character that was not gonna cause a copyright infringement lawsuit. All we needed was a professional painter that could pull it off and would stripe the car like they did in the sixties. Artist Micheal Swann delivered “The Prospector” artwork. We dig the sixties and old school hot rod art. Everyone who worked on the car signed their name under the deck lid. 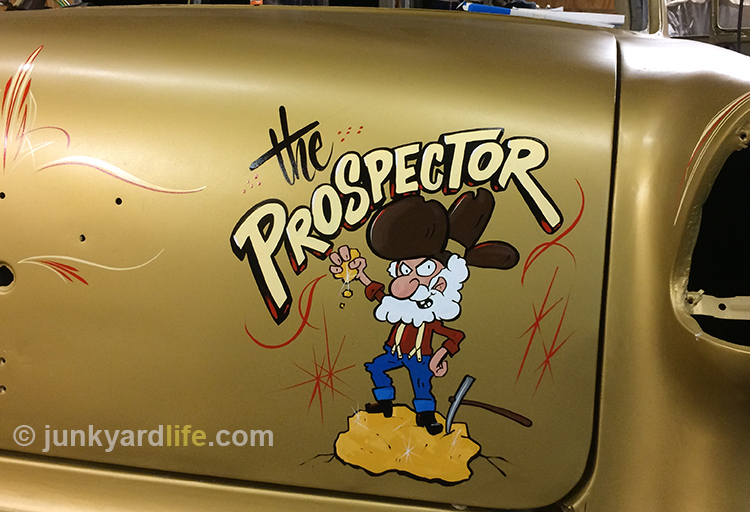 The Prospector character on the deck lid was originally going to be about one-quarter size of what it actually became. 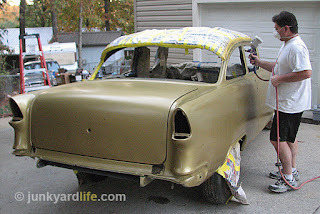 After we painted the roof, we covered it with newspaper to protect it when we painted the body gold. Unfortunately the paper settled into the black. Leaving us with 1990’s funny pages and department store ads melded into the paint. We thought about clearing over it and keeping it that way. The relocated shock tower brace changes the location of where the top shock bolts and bushings live. Originally, they actually went into the body of the car. The harsh bumps were actually softened by the body of the car. Bad idea. Your friends in the back seat better hope the road is smooth or they use stadium cushions. A: The first one was found on Anthony’s garage wall and I wanted it. B: Jason solved the mystery of what they were. 1949-1952 Bel-Air fully dressed hub caps when equipped with rare 15-inch wheels. C: I bought two more for $50 EACH from a collector who knew what he had and how bad I wanted them. I have no poker face. D: A dealer in Charlotte had a set, but refused to sell them to me because they “didn’t need to be wasted on a 55.” He was a purist. E: I finally bought an entire set to complete the ¾ set I had acquired. That whole set was $20.00. I now have three spares hub caps. The headers were installed several times. Interestingly, they were special ordered for a ’55 Chevy with power steering, which I added. They fit awesome on the side with the power steering box. 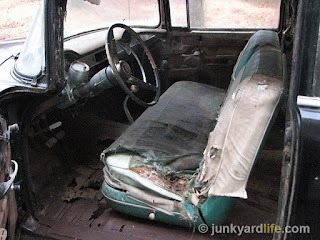 It was the passenger side that gave us tantrums and things had to be cut, trimmed, bent, and compromised. Jody Potter/Ron Kidd/Cutting Wheel/Big Hammer Solutions Inc! The body of the car was significantly lighter than what we anticipated. The night we initially took it off, we had about five guys per side and on the count of “three!” we almost tossed it into the rafters. After sandblasting the frame and before the new stuff was installed. I wanted to coat the frame. 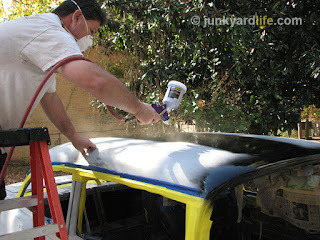 However, we are Junkyard Life and on a budget so we did it with with spray on bed liner. Spray on and brush on. Again, ventilation is important. Just ask the giant talking bunny that helped us. 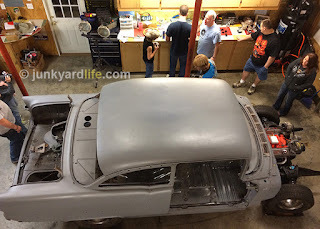 Ron Kidd’s 1955 Chevy in primer, view from the rafters. Project cars can take on a life of their own. What else would we do if we weren’t working on cars? Not the safest method to paint the roof of a ’55 Chevy? How would you do it? 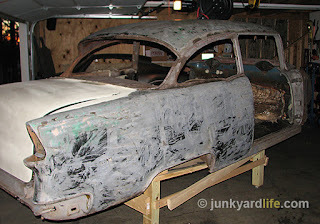 This was the beginning of what has become a seven-year journey with a barn find ’55 Chevy. 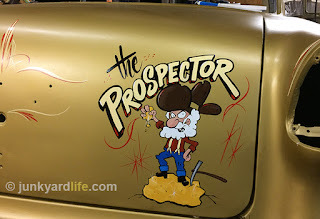 Stay tuned as “The Prospector” continues its road to gold! 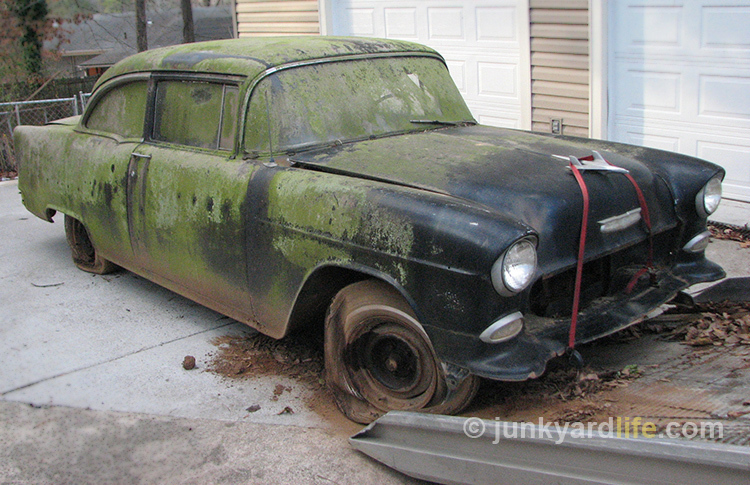 Look back at original story of when we found the Barn Find 1955 Chevy.